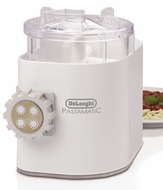 CONTINUOUS PASTA SYSTEM - This special system allows you to continuously add ingredients during kneading. So you get as much fresh pasta as you want without interruptions. PASTA ACCESSORIES INCLUDED - Choose from seven different screens for pasta just the way you like it. Plus, the screens are non-stick for easy cleaning. A key for changing the pasta screens, a measuring container and a recipe book are also included. Additional screens are available. TRANSPARENT MIXING BOWL - Allows you to easily view and monitor the entire pasta making process. PATENTED MIXING PADDLE - Patented system automatically mixes and kneads the dough with enough power to deliver professional-quality results. DUAL SAFE SYSTEM - The pasta maker is equipped with an automatic safety device that terminates operation if the lid is removed or if the bowl capacity exceeds the suggested amount. HEAVY-DUTY DIE-CAST ALUMINUM GEARS - Designed to resist wear for long lasting durability and maximum performance. WIDE-MOUTH FEED TUBE - Allows you to easily add ingredients. REMOVABLE PARTS - Make cleanup fast and simple.